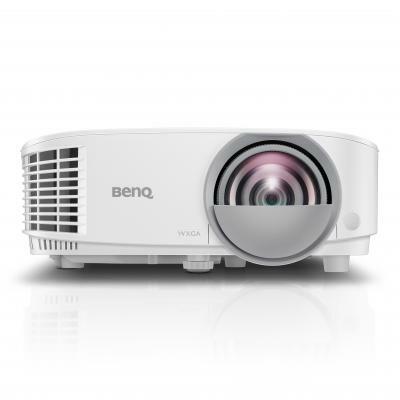 BenQ MW809ST interactive WXGA short throw education projector with 3000 ANSI Lumens, offer flexibility and image quality to enrich your teaching. Incorporating colour wheel sensors with an ingenious anti-dust accumulation feature, MW809ST prolongs optimal performance by rejecting dust which can accumulate on traditional sensors to block the IR signal and cause flickering, abnormal colours, or even shutdown. Offering a big screen in short distance with a 0.49 short-throw ratio, MW809ST eliminates distracting shadows and glare for students and teachers to engage and collaborate freely in front of the board. MW809ST produces 3,000 high ANSI lumen brightness and resolution for perfect projection performance with crisp images and sharp text even in bright lecture room. High brightness provides clear content under high ambient lighting, allowing lights to be kept on during classes for note taking and interactive collaboration.